In the Scottish Highlands and Islands the rebirth of nature is celebrated on Candlemas, or St Bride’s Day on 1 February. The tradition has weakened but the same feast has been celebrated since time immemorial. At its height, bonfires were lit on hilltops and there would be a festival with some young maid crowned with candles and honoured in Brigid’s stead. Candles were lit in every window and homes in the Isles were decorated with early flowers and greenery. Bride’s Crosses or Wheels were woven from corn and hung around the house. Women would also make a crib with a mattress of corn and hay. They called it Bride’s Bed and into it they tucked under a blanket a straw doll representing Bride, and beside her a wooden club. The crib was laid near the door surrounded by glowing candles. Food and drink were laid on the table and a decorated chair set by the hearth. Then just before they went to bed, the women of the house would call out three times: ‘Bride is come, Bride is welcome!’ Or they would go to the door and cry out into the night for Bride to enter their house. If Candlemas day be shower and rain, Winter is gone and will not come again. St Bride’s day, wherever it is celebrated, is one of the clearest examples of a pagan festival being adopted by Christianity because even the name has not changed. St Bride or Brigid simply took over the mantle of the pagan Brigid, chief goddess of not only the ancient Irish but Celts across a wide swathe of western Europe. The name in Gaelic means ‘bright flame’. In northern Britain she was called Brigantia, chief deity of the Brigantes tribe who were often led by warrior queens. Elsewhere she was called Brigit, Bride, Brighid, Brigandu and Berecynthia. As goddess of poetry, Brigid was keeper and dispenser of inspiration, the ‘fire of the soul’. The symbolism of water and fire is combined in the Cauldron of Inspiration, of which she is the keeper. She invented the Ogham alphabet and it is said of both pagan and Christian Brigids that they were struck in their forehead on birth by a shaft of fire from heaven. As goddess of earthly fire, the third Brigid was the patroness of metalcraft and all smith-work. In legendary battle her preferred weapons were the spear and arrow, and indeed one interpretation of her name is ‘Flaming Arrow’. 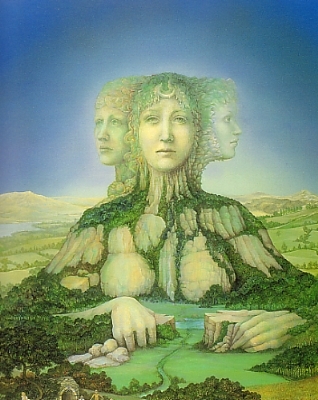 Brigid’s festival was one of the four main events in the ancient Celtic calendar because it marks the invisible rewakening of Nature within the cold earth. It was also sometimes called Oilmec, ‘Ewe’s Milk’ because it opened the season of lambing. On Brigid’s Night the maiden goddess of fruitfulness and abundance replaces the sombre hag who took possession of the year at Samain (Hallowe’en or All Saints Night). The grim goddess of reckoning and mortality is replaced by the smiling one of hope, full of virginal gaiety, beauty and promise. In Christian Ireland St Brigid is said to have been baptized by St Patrick himself. Later she founded the Abbey of Kildare where she worked many wonders. Along with Patrick and St Columba she became one of the three patron saints of Ireland. Sometimes called Mary of the Gael, she was made patron saint of poets, blacksmiths and healers. St Brigid seems to have been a real person but her legend and name blend so neatly with her pagan predecessor’s that one suspects some embellishing of the truth. Or perhaps she was, as her early followers must have believed, a fresh incarnation of the goddess, born into the Christian era to continue her ministrations within the new order. This is hinted at in the tales of St Brigid being weaned on milk from a white, red-eared cow, which were the colours of the Tuatha’s creatures. She was born in Uinmeras, about five miles from Kildare, on 1 February 453AD, or so it is said. Her father was Dubtacht (or Duffy), a pagan noble who may also have been a druid. Her mother was Brocessa, his Christian slave. Within a fenced enclosure at St Brigid’s Abbey of Kildare (or Cill Dara, the Church of the Oak), which no man was permitted to enter, there was kept alive a sacred fire. From St Brigid onward it was tended by nineteen nuns, each being responsible for a day at a time. On the eve of the twentieth day the last nun would place logs by the fire with the prayer: ‘Brigid, guard your fire, this is your night.’ And so she would. This ritual survived from ancient times when nineteen vestal virgins, or kelle, had tended the flame. They were virgins, though, in a much looser sense than their successors. On occasion they would take male pilgrims into their beds and conceive children by them. These children were given the surname ‘Kelly’ and supported by Brigid’s community. It’s doubtful that the Christian nuns continued this practice, but curiously many churches dedicated to St Brigid supported families named Kelly or O’Kelly until modern times, paying them all baptismal fees. St Brigid was notable among abbesses of the time for having the power to appoint her local bishop. And he was always a goldsmith. Many remarkable miracles of healing took St Brigid’s Abbey. One story tells how two lepers came to the sacred well at Kildare hoping to be cured. Brigid told one of them to wash the other, which he did and the disease peeled away from his skin. Then she told the cured one to likewise bathe his friend. But he shrank from touching the diseased flesh. So Brigid herself bathed the man and cured him. In 1220, some forty years after Gerald’s visit, a Norman-appointed Bishop grew angry at the exclusion of men from the Abbey at Kildare. Arguing that nuns were subordinate to priests, he demanded the gates be opened to allow inspection. When the nuns refused, the Bishop’s men forced their way in, declared the sacred flame to be a pagan superstition (quite correctly of course) and extinguished it. It was later rekindled but during Henry VIII’s Reformation it was once again put out, more or less finally. Despite being one of the three patron saints of Ireland, St Brigid’s authority has been steadily eroded through the ages by the Catholic Church, culminating in her de-canonization in the 1960s. Along with St George of England, the Vatican decided there was insufficient proof of her sanctity. Or, indeed, of her existence. At Kildare today Brigit’s ancient fire temple is marked by the Cathedral of St Brigid. Along with many of the most grand churches in Eire still, it is an Anglican establishment, a legacy of colonialism towards which the Catholics seem remarkably tolerant, given that only three per cent of the Republic’s population is Anglican. The Cathedral itself is a pleasing building of pale grey stone, more four-square than most Christian churches and with a tall round tower in one corner of the precinct. Beside the cathedral is a rectangular enclosure that marks the ancient hearth, with a sign saying ‘St Brigid’s Fire Temple’ (some anomaly here perhaps?). But there are few other concessions to the place’s ancient pre-eminence. The cathedral might still be dedicated to St Brigid but it celebrates her in a very muted way. Within the church there is a large stained glass portrait in the main aisle of Patrick and Columba but St Brigid is banished to a small window high in the central tower. This is pleasing enough in itself and shows Brigid with the famous flame on her brow, but you get the impression of St Brigid having been politely but firmly put in what the Anglican Church thought of as her place i.e. distinctly subordinate to her male counterparts. In the west window she appears again, apparently, but not very obviously. The rest of the windows have an overwhelmingly masculine tone. Similarly it is only the altar in the north transept that is obviously dedicated to her, with a Brigid’s cross hanging on the tapestry above it. The cross is possibly echoed in the tile pattern of the main floor but that’s it, really. However, if one is not feeling too militant on Brigid’s behalf it is, as I said, a very pleasant cathedral and it is something that the ‘Fire Temple’ has not simply been ploughed over. For a taste of true Brigid fervour one has to go to Bride’s Well a mile or so downhill in the rough direction that her statue in the marketplace is gazing (next to a bull-fertility testing station, ironically, or perhaps fittingly. Here an oak sapling can be found dressed with holy medals and scraps of cloth. Nearby grow the reeds from which true Brigid’s Crosses are woven. The Christian legend goes that St Brigid first wove one of these while keeping vigil by her father’s sickbed. When Dubtacht asked the meaning of it she explained the Gospel to him, whereupon, according to the tale, he saw the errors of his ways and became a Christian.